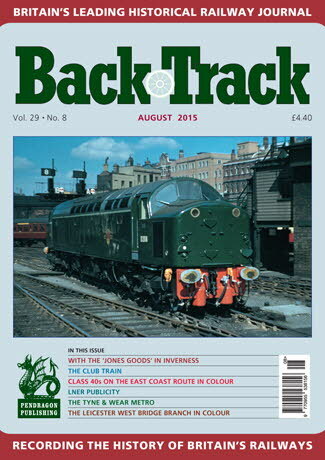 Railway Magazine | BackTrack August 2015 journal from Pendragon Publishing. The Development of Railways to the North West of Scotland - Giving Access to the Western Isles: Part Three - in the concluding part of this series Peter Tatlow looks at the final schemes put forward. From the Pendragon Archive: Kentish Rambles - archive photos of the main lines and branches of Kent. Behind the scenes at Crewe Works - three colour shots of locos outside the great workshops. With the 'Jones Goods' in Inverness - Neil Sinclair recalls the Highland Railway centenary celebrations in 1965. Quintinshill Revisited - David Wilson offers some further thoughts on the possible background to the 1915 disaster. It seemed like a good idea at the time: Part Two - Direct Pneumatic Propulsion - Miles Macnair considers some early alternatives to the locomotive-worked railway. London & North Eastern Railway Publicity - Alan Bennett shows some colourful holiday promotional materials from the 1930s. Oxford Union - colour shots of two 'Castle' 4-6-0s at Oxford station. Class 40s on the East Coast Route - colour spread by Gavin Morrison. Goods Train to Leicester West Bridge - Tommy Tomalin's colour photos of this former Midland Railway branch. The Club Train 1889-1893: Part One - Jim Greaves tells the story of an early adventure in the provision of luxury train services in Europe. Britain's Railways and the great War Food Crisis - Part Two: Going to work on an egg - Dr. Malcolm Timperley looks at railway participation in the cause of increased food production. Supertrams come to Britain - Geoffrey Skelsey describes the origins and development of the Tyne & Wear Metro. Lincolnshire Signalling - railway signalman Dafydd Whyles's photos of a last stronghold of mechanical signal boxes.